India satisfies most of her power requirement through thermal power. Thermal power generation constitutes about 56.5 per cent of the total installed capacity followed by renewable energy which is 21.2 per cent. Going forward, around 30 GW of coal-based capacity is expected to be added over the next five years largely led by under-construction projects of state and central entities, informs Rahul Prithiani, Director, CRISIL Research. Indian coal is high in ash, but is low in sulphur. Indian coal contains sulphur in the range of 0.25 per cent to 0.5 per cent. This range of sulphur content coal produces SO2 in the range of 1,500-2,000 microgram per cubic metre of flue gas (mg/Nm3). However, coal is also imported from Indonesia, Australia and South Africa for fuelling thermal power plants. This imported coal is high in sulphur content while being low in ash. The government has focused on reduction of emissions from coal-based thermal power plants in accordance with the Intended Nationally Determined Contributions (INDCs) submitted to the United Nations Framework Convention on Climate Change (UNFCCC) that has committed to curb emission intensity of its economy by 30-35 per cent from the 2005 level by 2030. Accordingly, the Ministry of Environment, Forest and Climate Change (MoEFCC), has issued notification no: S.O.3305(E) titled ‘Environmental (Protection) Amendment rules, 2015 dated 7.12.2015 with the objective of reducing emissions of suspended particulate matter (SPM), SOx, NOx and mercury at thermal power plants (TPPs). Prior to MoEFCC order, there were no norms for emission control of SO2. The expected SO2 emission in the existing units of capacity below 500 MW is in the range of 700 to 800 mg/Nm3 and in the units of capacity above 500 MW 650 to 750 mg/Nm3. According to the amendment the Thermal Power Plants has to comply the following norms specifically on Sulphur Dioxide (SO2) emission. As per the implementation plan prepared by Central Electricity Authority (CEA), the existing TPPs are required to comply with the new emission standards by the year 2022, informs Rajkumar Nagarajan, Joint Director, CPRI. With the MoEFCC order, it has become compulsory to install Flue Gas Desulphurisation (FGD) system in the existing and upcoming thermal power plants to curb SOx emissions. FGD is a system which reduces the SOx in flue gas through chemical treatment and converting the captured SOx into a by-product such as Gypsum or Calcium Sulphate or Sulphuric Acid depending upon the type of mechanism used. 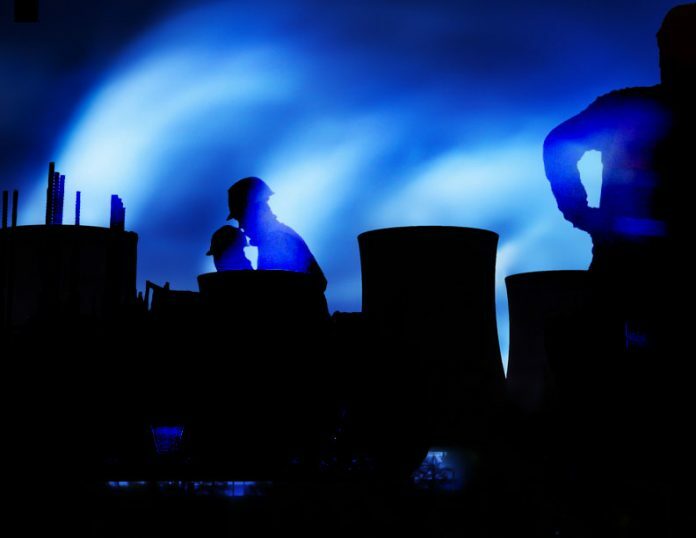 Globally around 80 per cent of the thermal power plants prefer wet scrubbing technology. Nagarajan, Joint Director, CPRI states, in a wet scrubber, a lime or limestone is used as sorbent which is sprayed in a tower where flue gas is passed and scrubbed to form Calcium Sulphite. This Calcium Sulphite is then oxidised to form Calcium Sulphate or Gypsum. This system involves usage large quantities of water. This water usage can be minimised by applying semi-dry scrubbers such as spray dry scrubbers (SDSs). According to FICCI report, Central Electricity Authority (CEA), along with regional power committees has drafted a plan for the phased implementation of FGD systems at power plants, covering approximately 160 GW of power plant capacity. CEA has earmarked 414 units of aggregate capacity of 161.092 GW for non-compliance of emission norms. Of these, 30 units of about 12 GW capacity will install FGD systems till 2019. 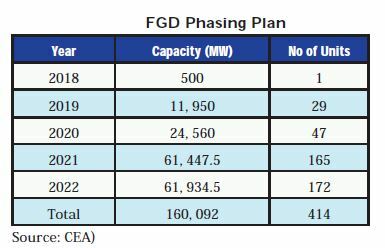 As of September 2018, FGD systems have been planned for 166,972 MW of capacity. Of these, FGD has been successfully commissioned in power plant units of 1,820 MW. 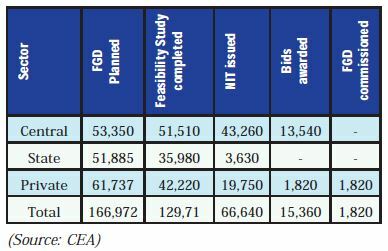 Bids are awarded for capacity of 15,360 MW. Apart from this feasibility studies are completed for 12,971 MW capacity units. Solapur super thermal power project – 2×660 MW. Tanda Stage II super thermal power project – 2×660 MW. Feroze Gandhi Unchahar thermal power project – 1×500 MW. Meja thermal power project – 2×660 MW by Meja Urja Nigam Private Limited (a JV of NTPC & UPRVUNL). As per the new reports, these new awards build on GE Power’s expertise in Wet FGD systems with the recent completion of facilities and performance guarantee tests for wet FGD at NTPC’s Vindhyachal Stage V/Unit 13 – 1 x 500 MW thermal power plant and awarded contract for wet FGD for NTPC’s 2×800 MW Telangana thermal power project earlier this year. Sembcorp Energy has also started bidding for setting up of two FGD units worth Rs 1000 crore in two power plants with a total capacity of 2,640 MW in Andhra Pradesh. The capital cost of FGD is additional in a new or existing thermal power plant. As per a recent Centre for Science, Technology and Policy (C-STEP) Report, the total cost of installing pollution control technology in thermal power plants is around Rs. 3.91 – 3.96 lakh crore till 2030. FGD in TPPs entails an approximate expenditure of Rs 50–60 lakh per MW. The C-STEP study has projected that, to meet the additional expenditure to meet the new emissions standards, the electricity tariffs may need to go up by 25-75 paise per kWh. In that direction, the government notified that investments for emission control technologies such as FGD wold be considered for pass through in tariffs. According to Nagarajan, FGD systems are very reliable and proven commercial technologies are available with a byproduct of saleable gypsum production in many cases. As a commitment to comply with the stringent environmental regulations and emission control, these systems are essential. As a commitment from owner for improved environmental emissions from the plant these investments are inevitable and obviously the same has to be shared by the consumers (users) too. All the TPPs have to comply to the new emission norms by the year 2022. So, for retrofit the TPPs has to work on this stringent time line. An overall project period of 30 to 36 months is required. During retrofit of the FGDs, shutdown of the unit for about 6 months is envisaged. These amounts for a revenue loss burden to the TPPs. An additional auxiliary power of 1.5 to 2.0 per cent is envisaged on account of the additional FGD being installed. Space constraint for installation of FGD as retrofit in the existing old plant. In case of greenfield projects this is not a burden. However, in case of old plants, the layout is already in place and the available space will not be adequate to install the new FGD units. This need to be meticulously planned within the available space to accommodate for multiple units. The addition of new FGD will increase the capital cost and recurring O&M cost of the units. Thus, the generation cost will increase marginally. The envisaged capital expenditure on account of FGD will be about Rs 0.4 crore to 0.5 crore/MW. Depending upon the type of FGD, there will be an additional resource requirement such as water and limestone. Further, the mobilisation of limestone for FGD in power plants creates its own environmental footprint, which needs to be studied and compared to the benefits of installation of FGDs. FGD is definitely the need of the hour to improve the environmental performance of the thermal power generating stations. This has led to creation of a new market in India for these technologies, concludes Nagarajan. Moreover, the timeline committed by the CPCB for implementation of FGD is very challenging, and the government will have to be vigilant to ensure that targets are met by all stakeholders.